Plum curculio is a key pest in eastern US apple orchards, and is considered to be one of the primary pests limiting organic apple production in this region. Studies to determine the effectiveness of Native Strains of Entomopathogenic Nematodes for Plum Curculio Management are on going throughout New York State. The use of entomopathogenic nematodes (EPNs), S. carpocapsae (strain ‘NY 001’), S. feltiae (strain ‘NY 04’), and H. bacteriophora (strain ‘Oswego’), to determine their potential use as PC biocontrol agents. The infective juveniles (IJs) are native to NY, adapted to persist under NY conditions, have shown efficacy against last instar plum curculio (PC) larvae, which burrow in the soil to pupate. In ENY field trials, we applied nematode IJs of S. feltiae and S. carpocapsae to the soil surface using an ATV-mounted modified spray boom with 5 fertilizer (0010) nozzles and traveling between 3.0–3.5 mph. Applications of a 50:50 combination of S. feltiae and S. carpocapsae IJs were made to the orchard rows and row middles in four 2-row plots, at a rate of approximately 450 million total IJs/A. The use of micro-plot exposure arenas (4.5″ diameter x 5″ deep) lined with acrylic tube sleeves are being used to place PC larva assess PC emergence. 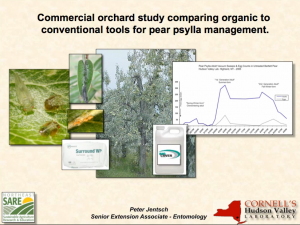 Establishment and Study of Sustainable and Organic Orchard Management Practices Using Disease Resistant Apple. A one-acre block of apple, employing 9 newly developed disease resistant, traditionally bred through the Purdue, Illinois and Rutgers breeding program, were grafted onto G11 fireblight resistant rootstock and planted at 3’ x 11’ spacing. Trees were trained and pruned using high yielding ‘Slender Spindle’ tree architecture of 1100 trees per acre to optimize yield and reduce carbon inputs. 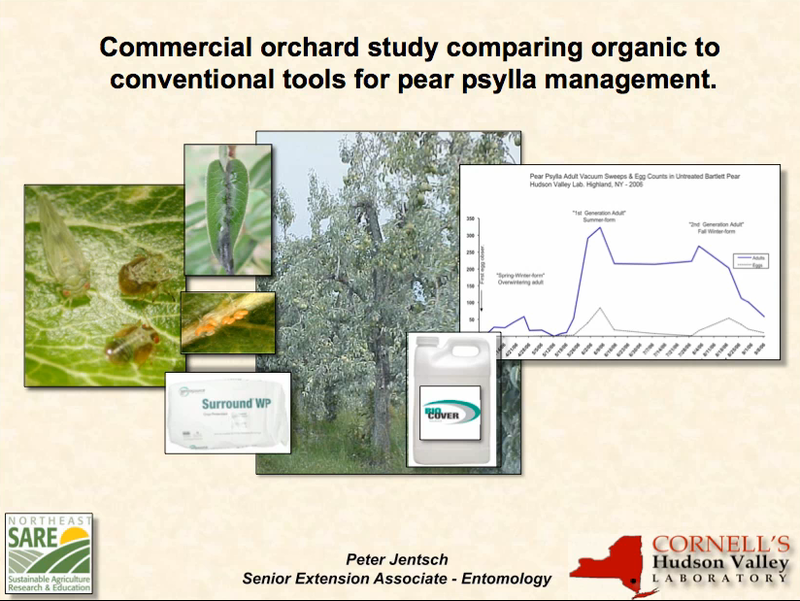 Development of Biological Control in Conventional and Organic Tree Fruit. 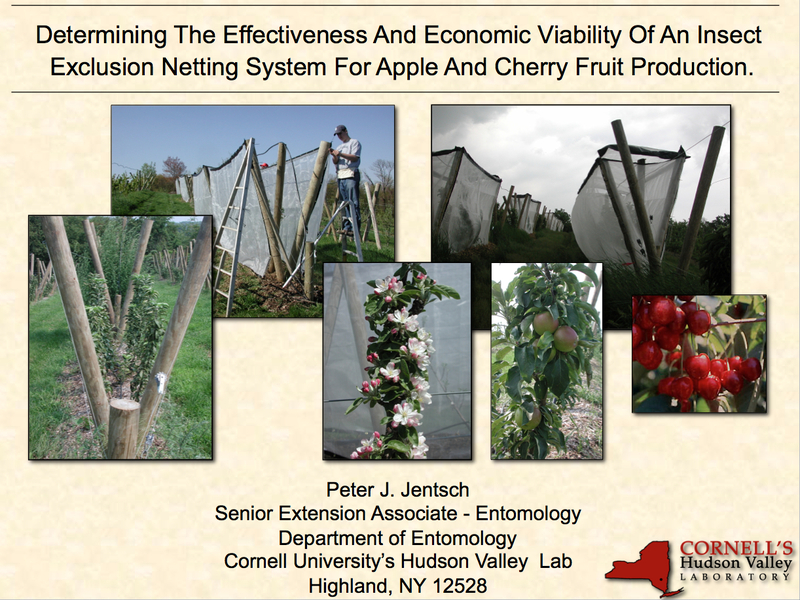 Classical Biological Control Study Employing the Predatory Mite Complex to manage European Red Mite and Two Spotted Spider Mite in Hudson Valley and Lake Champlain Apple. The Northeast Sustainable Agricultural & Education (NESARE) is a regional program of the nationwide SARE effort; SARE is part of the USDA National Institute of Food and Agriculture, or NIFA. The NESARE program serves all states and Island Protectorates. To learn more about the program nationwide, visit the national SARE website. To see what grants have been awarded in your state, go to our state programs pages. The Northeast Sustainable Agricultural & Education (NESARE) provides research support to non-profit organizations throughout Connecticut, Delaware, Maine, Maryland, Massachusetts, New Hampshire, New Jersey, New York, Pennsylvania, Rhode Island, Vermont, West Virginia, and Washington, D.C.